Restorative yoga is a beautiful style of yoga that’s both powerful and gentle. 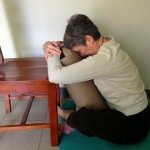 As mentioned in previous articles, restorative yoga is a term for poses done with the full support of bolsters, straps, blankets, or blocks—allowing the practitioner to comfortably sink into a pose that’s held for between 5 and 10 minutes so they can be completely relaxed, absorbed, and present. An excellent low-impact exercise, restorative yoga provides the benefits of movement without the strain. A consistent practice not only helps to energize the physical body, it also promotes a balanced mood and sharp mind. Another advantage of the gentle twisting poses and stretches in restorative yoga is that it slows the loss of bone density—vital for preventing osteoporosis. There’s a yogic saying, “The body is as young as the spine is flexible.” The gentle stretching of restorative yoga goes a long way toward increased flexibility and a greater range of motion. Supported Seated Forward Bend helps keep the spine pliable and promotes healthy circulation in the spinal cord. It’s a pose you simply melt into. • Place a chair on the floor at one end of your yoga mat—a sturdy chair that won’t slide when you lean into it for support. • Sit cross legged on the mat facing the front of the chair. You may want to sit on a folded blanket or bolster for added comfort. 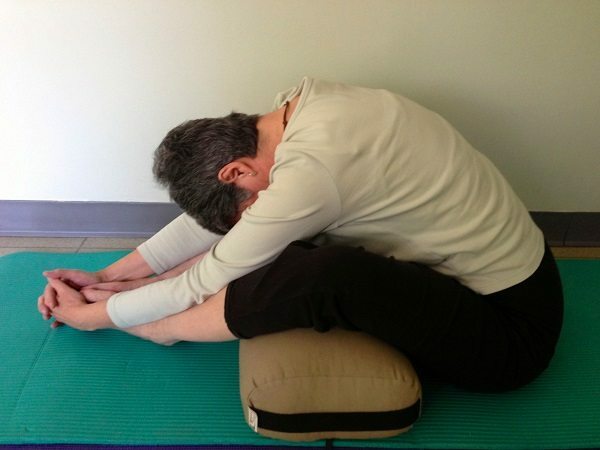 • Place a yoga bolster lengthwise between you and the chair, with one end in the circular space between you and your crossed ankles, and the other end leaning against the chair. • Bend forward, allowing the full weight of your torso and head to lean—melt—into the bolster for support. • Rest your forehead on the bolster or turn your head gently to the side—whichever position is most comfortable for you. • Rest your hands on the exposed end of the bolster. • For comfort, switch the cross of your legs at the halfway point. • To enhance the stretch, simply reach your hands to each side of the chair back and gently pull and hold to lengthen the side body and spine. • Gently scoot back to the middle of your mat, taking the bolster with you. • With legs fully outstretched, place the bolster sideways beneath your knees. • Adjust your seat so that your sit-bones are comfortable—again, you may want a folded blanket underneath you. • Slowly bend forward until you’re looking at the bolster between your knees. • Gently grasp your feet in your hands. • Close your eyes and observe your breath as before—inhale “calm,” exhale “chaos”—as you let your body fully relax into this pose. This gentle variation offers an even deeper stretch to the back, spine, side body, and intercostal muscles in-between the ribs.